Variation Accepted: Operating between Plymouth Bus Station and Paignton Bus Station given service number X80/X81 effective from 04-Dec-2011. To amend Timetable. PH1101608/2 - TREVELLYAN JACKETT T/A JACKETT'S COACHES, KINGSETT HOUSE,, ALBASTON, GUNNISLAKE, PL18 9AL Variation Accepted: Operating between Plymouth, Bretonside Bus Station and Truro, Bus Station given service number X5 effective from 15-Nov-2011. To amend Route and Timetable. PH1081198/11 - TALLY HO! COACHES LIMITED, STATION YARD INDUSTRIAL ESTATE, KINGSBRIDGE, TQ7 1ES Variation Accepted: Operating between Newton Ferrers and Plymouth Bus Station given service number 94 effective from 19-Dec-2011. To amend Timetable. PH0004983/133 - FIRST DEVON & CORNWALL LTD, THE RIDE, CHELSON MEADOW, PLYMOUTH, PL9 7JT Cancellation Accepted by SN: Operating between BARNSTAPLE Bus Station and WOOLACOMBE Sands given service number 303 effective from 19-Sep-2011. PH0004983/134 - FIRST DEVON & CORNWALL LTD, THE RIDE, CHELSON MEADOW, PLYMOUTH, PL9 7JT Cancellation Accepted by SN: Operating between ILFRACOMBE Bus Station and PLYMOUTH Bus Station given service number X85 effective from 18-Sep-2011. PH0004983/419 - FIRST DEVON & CORNWALL LTD, THE RIDE, CHELSON MEADOW, PLYMOUTH, PL9 7JT Cancellation Accepted by SN: Operating between Holsworthy and Tavistock given service number X85 effective from 18-Sep-2011. PH0004983/420 - FIRST DEVON & CORNWALL LTD, THE RIDE, CHELSON MEADOW, PLYMOUTH, PL9 7JT Cancellation Accepted by SN: Operating between Tavistock and Plymouth given service number X85 effective from 18-Sep-2011. PH0004983/330 - FIRST DEVON & CORNWALL LTD, THE RIDE, CHELSON MEADOW, PLYMOUTH, PL9 7JT Variation Accepted: Operating between Plymouth Royal Parade and Blackstone Close given service number 6 effective from 10-Dec-2011. To amend Timetable. PH0004983/337 - FIRST DEVON & CORNWALL LTD, THE RIDE, CHELSON MEADOW, PLYMOUTH, PL9 7JT Variation Accepted: Operating between Plymouth Royal Parade and Mount Batten given service number 2 effective from 10-Dec-2011. To amend Timetable. PH0004983/396 - FIRST DEVON & CORNWALL LTD, THE RIDE, CHELSON MEADOW, PLYMOUTH, PL9 7JT Variation Accepted: Operating between Plymouth City Centre and Mainstone given service number 15 effective from 10-Dec-2011. To amend Timetable. PH0004983/434 - FIRST DEVON & CORNWALL LTD, THE RIDE, CHELSON MEADOW, PLYMOUTH, PL9 7JT Variation Accepted: Operating between Plymouth, Royal Parade and Elburton Village given service number 7 effective from 10-Dec-2011. To amend Timetable. PH0004983/333 - FIRST DEVON & CORNWALL LTD, THE RIDE, CHELSON MEADOW, PLYMOUTH, PL9 7JT Variation Accepted: Operating between Plymouth Royal Parade and Mount Gould given service number 5 effective from 03-Jan-2012. To amend Route and Timetable. I will go into a bit more detail on these changes over the next day or two, but so far nothing too drastic has caught my attention! 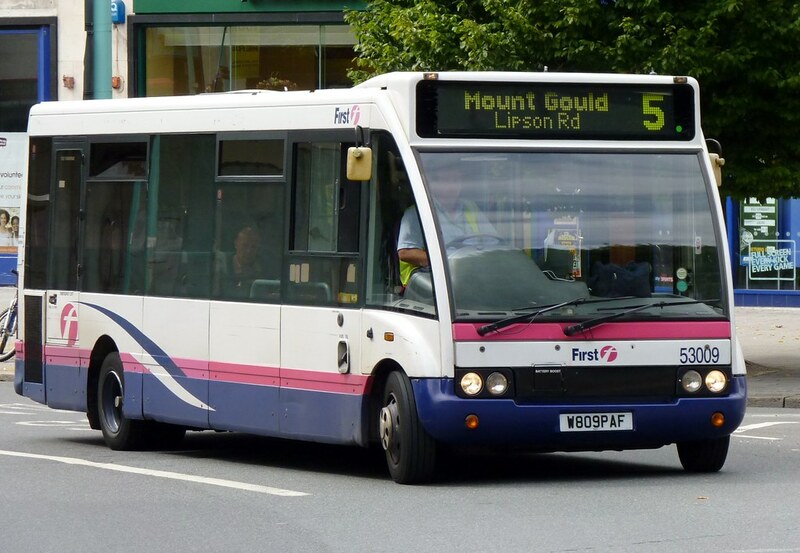 The changes to the UGO routes in Plymouth, i.e 2,6,7 and 15 all seem to be a reduction in frequency on Saturday afternoons...for eg the 15 remains the same times/route, 20 min frequency Mon to Friday and Saturdays until around 3pm then goes 30 min frequency between 3 and 7pm!! Not sure why, perhaps they have kless customers Sat PM compared the rest of the week?? I have to say the UGO15 is quieter later on Saturday compared to the rest of the week when I use them ?? ?